Overall survival of patients undergoing Ivor-Lewis esophagectomy (n = 123) from January 1, 1990, through December 31, 2001. Triangles represent censored patients. Median survival was 25 months; 5-year survival, 22%. Overall survival of patients with esophageal cancer based on pathological staging. Patients with stage I disease (n = 21) had a greater than 50% overall 5-year survival. Patients with stage IIa disease (n = 21) had a median survival of 41.2 months; with stage IIb disease (n = 20), 27.6 months; and with stage III disease (n = 38), 17.9 months. Symbols represent censored patients (log-rank comparison, P =.02). Overall survival of patients with locally advanced esophageal cancer who received neoadjuvant chemoradiotherapy followed by surgery (CRS group [n = 27]) or surgery followed by adjuvant chemoradiotherapy (SCR group [n = 25]). Symbols represent censored patients (log-rank comparison, P= .76). Not Available, Acute Radiation Morbidity Scoring Criteria. Radiation Therapy Oncology Group Web site. Available at: http://rtog.org/members/toxicity/acute.html. Accessed October 1, 2003. Not Available, RTOG/EORTC Late Radiation Morbidity Scoring Schema. Radiation Therapy Oncology Group Web site. Availablle at: http://rtog.org/members/toxicity/late.html. Accessed October 1, 2003. Hypothesis Patients receiving neoadjuvant chemoradiotherapy followed by surgery (CRS) undergo downstaging of their tumor and have improved survival when compared with patients undergoing surgery followed by adjuvant chemoradiotherapy (SCR). Setting Tertiary-care university medical center. Patients One hundred twenty-three patients with squamous cell carcinoma and adenocarcinoma of the esophagus underwent Ivor-Lewis esophagectomy from January 1, 1990, through December 31, 2001. Of these, 31 received CRS; 27, SCR; and 65, surgery alone. Interventions Patients were candidates for neoadjuvant or adjuvant therapy if they had locally advanced disease (T3/T4 N0 or any T stage with N1). Neoadjuvant and adjuvant therapies were nonrandomized and based on the preference of the treating oncologist and surgeon. Main Outcome Measurements Pathological downstaging was analyzed in the patients receiving CRS. Operative mortality, postoperative morbidity, median survival, and overall survival were compared between the CRS and SCR groups. Results Pathological downstaging (as characterized by TNM staging) was observed in 20 (64%) of the patients receiving CRS. Complete pathological responses occurred in 5 (16%) of the patients undergoing CRS. No 30-day mortality was observed in either treatment group. No statistical difference in survival was observed between groups, although a trend suggested improved survival with neoadjuvant therapy (3-year survival in CRS and SCR groups was 45% and 22%, respectively; P = .15). Complete pathological responders in the CRS group had a 1-year survival of 80% compared with 29% in nonresponders (P = .25). No statistical differences were observed between groups in relation to blood loss, length of hospital stay, mortality, or morbidity. Conclusions Neoadjuvant chemoradiotherapy effectively downstages cancer in patients with locally advanced esophageal disease. Morbidity and operative mortality were not significantly different between patients receiving neoadjuvant and adjuvant therapy. The difference in overall survival between the 2 groups did not reach statistical significance, although a trend at 3 years was observed. 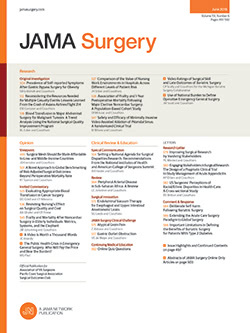 Many randomized clinical trials have reported conflicting results on the effectiveness of neoadjuvant chemotherapy (without radiotherapy) before surgical resection.6,7,13-17 Similarly, the effectiveness of neoadjuvant chemoradiotherapy has not been established.8,18-22 It is believed that with more effective chemoradiotherapy23,24 and a selective approach to neoadjuvant therapy,25,26 survival of resectable esophageal cancer can be improved. We report our experience with chemoradiotherapy in the treatment of locally advanced (T3/T4 N0 or any T stage disease with N1)27 esophageal cancer. From January 1, 1990, through December 31, 2001, 137 patients with esophageal cancer underwent Ivor-Lewis esophagectomy at the Department of Surgery, Loyola University Medical Center, Maywood, Ill. Fourteen medical charts were not recoverable, and these patients were therefore excluded from the study. The remaining 123 patients underwent analysis with overall survival, operative mortality, and morbidity as primary end points. Pathological downstaging after neoadjuvant chemoradiotherapy was a secondary end point. All patients underwent endoscopic evaluation with biopsy. Endoscopic ultrasonography (EUS) was performed on patients after 1996 with the use of a 7.5-mHz radial array probe to assess the depth of tumor penetration and the presence of regional lymphadenopathy. Computed tomography (CT) of the chest and abdomen was performed to evaluate for metastatic disease. Before the availability of EUS, CT was used as the sole modality for clinical staging. Of the 31 patients who underwent neoadjuvant therapy, 13 underwent evaluation with EUS and CT. In addition, a cardiopulmonary evaluation was performed using noninvasive cardiac and pulmonary function testing. Those patients who underwent chemotherapy received an indwelling central venous catheter and were treated as outpatients. One of 2 regimens was used. The first regimen23 consisted of fluorouracil, carboplatin, and paclitaxel. Fluorouracil, 225 mg/m2 per day, was administered as a continuous intravenous infusion from days 1 through 42. Carboplatin dose was adjusted to an area under the concentration time curve of 6.0 (calculated using the method of Calvert et al28) and given intravenously during 1 hour on days 1 and 22. Paclitaxel dose was 200 mg/m2 and also given intravenously during 1 hour on days 1 and 22. Premedication before paclitaxel administration consisted of dexamethasone sodium phosphate, 20 mg; cimetidine hydrochloride, 300 mg; and diphenhydramine hydrochloride, 50 mg, given intravenously 30 minutes before infusion. If on day 21 the white blood cell count was less than 2000 cells/µL or the platelet count was less than 100 000 cells/µL, the carboplatin and paclitaxel infusions were delayed for 1 week and restarted at full dose. If hospitalization was required for neutropenia or fever, the carboplatin and paclitaxel infusions were reduced to 75% of the starting dose. If hospitalization was required for neutropenia or fever or for grade III/IV mucositis, the fluorouracil infusion was temporarily discontinued. The second regimen29 consisted of fluorouracil and cisplatin. Fluorouracil, 1000 mg/m2, was administered as a continuous intravenous infusion for the first 4 days of weeks 1, 5, 8, and 11. Cisplatin, 75 mg/m2, was infused on the first day of each course. Cisplatin was withheld if the serum urea nitrogen or creatinine level was persistently elevated. The dose of cisplatin was reduced by 25% and 50% if the white blood cell count was less than 3000 or 1000 cells/µL, respectively, or if the platelet count was less than 75 000 or 50 000 cells/µL. Before 1997, 2-dimensional treatment planning was used. After 1997, CT-based simulation and 3-dimensional treatment planning was performed using the Focus Planning System (Computerized Medical Systems, Inc, St Louis, Mo). The clinical target volumes encompassed the macroscopic tumor (identified on CT, esophagography, esophagoscopy, or EUS) with a 5-cm cephalocaudad margin and a 2-cm radial margin also including lymph nodes at risk in the mediastinum. The celiac nodes were included if a distal esophageal cancer or more proximal esophageal cancer with celiac adenopathy (demonstrated by EUS) was present. For both chemotherapy regimens (combined fluorouracil, carboplatin, and paclitaxel and combined fluorouracil and cisplatin), single daily fractions of 180 rad (1.8 Gy) were given 5 times per week for 5 weeks to a total dose of 4500 rad (45 Gy). In addition, patients received a 540-rad (5.4-Gy) boost to a total dose of 5040 rad (50.4 Gy) to the gross tumor volume with a 2-cm cephalocaudad margin. Multifield techniques limited radiation exposure to normal tissue and restricted spinal cord doses to less than 4500 rad (45 Gy). The treatments were delivered using a linear accelerator (Varian Medical Systems, Palo Alto, Calif) with multileaf collimation using 6- or 10-mV photons as the simulated plan required. Acute and late radiation toxic effects were scored according to the Radiation Treatment Oncology Group (RTOG) morbidity scoring criteria.30,31 Radiotherapy was stopped for toxic effects of grade 3 or higher. For patients who developed grade 3 or higher toxic effects unrelated to radiation (oral mucositis and hand-foot syndrome), radiotherapy was continued. If the absolute neutrophil count was lower than 1000 cells/µL or the platelet count was less than 75 000 cells/µL, chemotherapy and radiotherapy were stopped until the toxic effects were no longer present. If hospitalization was required for febrile neutropenia, radiotherapy was also temporarily discontinued. The abdominal portion of the Ivor-Lewis esophagectomy was performed through a bilateral subcostal abdominal incision. The stomach and duodenum were mobilized with careful preservation of the right gastroepiploic artery and, when possible, the right gastric artery. Perigastric lymph nodes were taken en bloc with the specimen. The esophagus was mobilized and bluntly dissected through the diaphragmatic hiatus. A pyloroplasty was performed and, according to surgeon preference, a feeding jejunostomy was placed. The thoracic portion of the procedure was performed through a right-sided fifth intercostal incision. After further dissection of the intrathoracic esophagus, including periesophageal lymph nodes, the azygos vein was divided. A 5-cm proximal margin was taken, and for midthoracic lesions, this margin was evaluated by means of frozen section. A gastric tube was fashioned using a gastrointestinal anastomosis stapler, and the esophagogastrostomy was performed using a single-layer, hand-sewn anastomosis. A transanastomotic nasogastric tube and 2 chest tubes were routinely placed. Postoperative esophagograms were routinely obtained on postoperative days 5 through 7. Metoclopramide hydrochloride therapy was started on resumption of an oral diet and continued after the patient was discharged. Perioperative β-blockade was not routinely used. The operating surgeon followed up patients at 3-month intervals for the first year and every 6 months thereafter. A complete blood cell count, measurement of electrolyte levels, liver function tests, CT scan, and esophagoscopy were performed on a yearly basis for the first 3 years, and then were obtained when clinically indicated. Median length of follow-up in surviving patients was 33 months. Kaplan-Meier survival analysis with log-rank comparison and analysis of variance with a Tukey post hoc test were used to determine differences between groups (SPSS version 11.5; SPSS Inc, Chicago, Ill). A Levene test was performed on all mean comparisons to ensure variance equality. A z test was performed to determine differences between percentages (SigmaStat version 2.03; SPSS Inc). Except where indicated, averages are expressed as mean ± SD. The average age of all patients was 62 ± 11 years, and 16% were female (Table 1). The most common presenting complaint was dysphagia (72%), followed by weight loss (47%), heartburn (42%), and odynophagia (14%). Adenocarcinoma was the most common histological finding (76%), followed by squamous cell carcinoma (18%). The remaining 4% consisted of small cell carcinoma. Barrett esophagus was present in 53% of patients with adenocarcinoma. Postoperative complications occurred in 56% of patients. The most common complication was pneumonia (17%), followed by atrial fibrillation (8%), pleural effusion (5%), anastamotic leak (4%), pneumothorax (3%), and chylothorax (1.5%). The 30-day mortality was 2.4%. Overall 5-year survival was 22% (Figure 1), with pathological staging being a major determinant of survival (Figure 2). Patients who underwent Ivor-Lewis esophagectomy were grouped on the basis of their treatment regimen. A total of 31 patients were treated with neoadjuvant chemoradiotherapy followed by surgery (CRS), 27 with surgery followed by adjuvant chemoradiotherapy (SCR), and 65 with surgery alone (SA). The average ages of these patients were 60 ± 7, 55 ± 11, and 65 ± 11 years, respectively (P = .001 for SCR vs SA). These 3 groups were similar in regard to the number of women in each group and the percentage of patients with a history of tobacco use and diabetes mellitus (Table 1). No difference in operative morbidity and mortality between the 3 groups was observed (Table 2). Complications occurred more frequently in the SA group (56%) compared with the CRS group (45%). Although it did not reach statistical significance, this difference could be related to the older age of the SA group. The average surgery time was longer in the CRS group (396 ± 55 minutes) but was not significantly different from that of the SCR and SA groups (371 ± 87 and 366 ± 77 minutes, respectively; P = .24). The estimated blood loss was also similar between the 3 groups (P = .68). The complication rate was 45% in the CRS group, 44% in the SCR group, and 56% in the SA group (P = .44). In addition, we found no difference in the average length of hospital stay between the CRS (14.5 ± 12.4 days), SCR (11.5 ± 8.3 days), and SA groups (16.0 ± 16.0 days; P = .49). Thirty-day mortality was low in all 3 groups and did not reach statistical significance. Various combinations of neoadjuvant and adjuvant regimens were used. The most common neoadjuvant regimen was combined fluorouracil and cisplatin, followed by combined fluorouracil, carboplatin, and paclitaxel. The most common adjuvant therapy was with fluorouracil infusion alone. Other combinations of paclitaxel, cisplatin, carboplatin, and etoposide phosphate were also used. The pathological characteristics were similar between groups (Table 3). Adenocarcinoma was the most frequently observed histological finding in all 3 groups, accounting for approximately 80%. All groups had a similar percentage of patients with tumors in the middle or lower third of the esophagus, or at the gastroesophageal junction. The distribution of cancer staging did not differ between the CRS and SCR groups. However, the SA group consisted of significantly more patients with stages I (P = .002) and IIA (P = .02) disease. Furthermore, nearly all patients in the CRS and SCR groups had locally advanced disease, whereas these stages accounted for a smaller fraction of the SA group (P = .01 and P = .001, respectively). Survival analysis demonstrated no statistically significant difference between the CRS and SCR groups (log rank P = .76; Figure 3). Median survival was 24.1 months in the CRS group, 23.1 months in the SCR group, and 28.7 months in the SA group (Table 4). We found no difference in survival at 1, 3, and 5 years, despite a trend toward improved survival in the CRS group at 3 and 5 years. Patients who were considered for neoadjuvant therapy were diagnosed by means of esophagoscopy and biopsy and underwent clinical staging with CT and EUS. Based on the comparison of the clinical (preoperative) and pathological staging, 16% demonstrated a complete pathological response (no residual disease); 48%, a partial pathological response; and 23%, no response (Table 5). Patients with complete and partial responses had median survivals of 25 and 38 months, respectively, whereas those who had no response had a median survival of only 14 months. The 1-year survival in patients with complete responses, partial responses, and nonresponses were 80%, 60%, and 29%, respectively. Five-year survival for esophageal cancer when first reported in the 1980s was a dismal 4%.5 Since then, decreased operative mortality and early detection of esophageal cancer has contributed to a modest improvement in overall survival to approximately 20%. During the same period, interest in multimodal therapy to further improve survival has prompted several randomized clinical trials to validate the benefit of neoadjuvant chemoradiation.8,18-22 Although most of these trials have shown a trend toward improved survival, only the Irish trial by Walsh et al19 showed a difference that was statistically significant. These trials studied all patients with resectable esophageal cancer, including very early cancers limited to within the esophageal wall (T1 or T2). These patients with early cancer can be cured with surgery alone with excellent survival, as demonstrated by our data. No randomized clinical trials show the benefit of the addition of neoadjuvant or adjuvant therapy for this group of patients. Moreover, 1 retrospective trial from The Cleveland Clinic, Cleveland, Ohio, by Rice and colleagues25 showed that the addition of neoadjuvant chemoradiotherapy may actually be harmful for early esophageal cancers. Once tumor invasion is beyond the muscularis propria (T3 or T4), at least 77% will have nodal involvement.32 The prognosis for this group of patients with transmural disease and nodal involvement is significantly worse than that for patients with early cancers.33,34 This group of patients with locally advanced esophageal cancers may derive the most benefit from neoadjuvant therapy through early treatment of distant micrometastases and tumor downstaging.26 This study reflects our treatment philosophy for resectable esophageal cancers, ie, that locally advanced cancers can benefit from the addition of neoadjuvant chemoradiotherapy. Although this study was not able to show a statistically significant improvement in survival between the CRS and SCR groups (P = .15 for 3-year survival), we believe that with greater sample sizes and longer follow-up to 5 years, the improvement in survival may reach statistical significance. Modalities available for preoperative staging of esophageal cancer include CT, EUS with and without fine-needle aspiration, positron emission tomography (PET), and minimally invasive surgery. These modalities have made it possible to stratify patients before treatment and to assess the response to chemoradiotherapy. We have used CT scanning primarily for the evaluation of metastatic disease and, before the availability of EUS, for the evaluation of regional lymph nodes and tumor depth. Although excellent for determining the presence of distant metastasis and therefore resectability, the CT scan is poor at determining cT and cN staging. Endoscopic ultrasonography has been proved to be the superior modality for assessing tumor depth and regional lymphadenopathy with accuracies of 84% and 77%, respectively.35 Moreover, EUS is highly effective in differentiating T1/T2 tumors from T3/T4 tumors,36,37 which is particularly pertinent to patient selection for neoadjuvant therapy. Fine-needle aspiration with EUS has been reported to improve the accuracy of N staging to 93%,38 and PET has been reported to improve the accuracy of M staging to 91%.39 We have recently added these modalities to our preoperative strategy and results are forthcoming. Some enthusiasm exists for minimally invasive techniques such as thoracoscopy and laparoscopy for nodal staging and evaluation of metastases,40,41 but we have not included this modality in our workup. Since our group of patients undergoing neoadjuvant chemoradiotherapy consisted solely of those with locally advanced disease, only 16% achieved a complete pathological response compared with the 25% published by other groups.8,18,19 Any pathological response, however, was observed in a total of 20 patients (64%). Complete responders enjoyed a superior 1-year overall survival (80%) compared with the nonresponders (29%). Cisplatin and fluorouracil are currently considered the standard combination chemotherapy.6 With the addition of paclitaxel, complete pathological response rates as high as 30% to 38% have been reported.23,24 Because we only recently started adding paclitaxel to our carboplatin-based regimen, our results are not mature. It is possible that, with the current regimen of fluorouracil, carboplatin, and paclitaxel, we will see an even greater complete pathological response, leading to an overall improvement in long-term survival. Operative morbidity is common after esophagectomy. Our complication rate of 56% is consistent with that of another recently published series.42 Concern exists over increased morbidity after neoadjuvant therapy. Resulting inflammation, fibrosis, and poor tissue oxygenation potentially contribute to poor wound healing. The operative dissection is not more difficult if surgery is performed within 6 weeks of the completion of neoadjuvant therapy and may be less difficult because of tumor downstaging. Several studies,19,43,44 including the present one, have not demonstrated a significant increase in operative morbidity with the addition of neoadjuvant therapy, including anastomotic leak and pulmonary complications. Restaging with EUS was inadequate for clinical decision making. Our patients have not undergone routine restaging after neoadjuvant therapy, although some experience has been reported with restaging using PET with fludeoxyglucose F 18.46 No consideration was given to observation only after the completion of neoadjuvant therapy unless progression to metastatic disease was observed. Until more accurate modalities become available, patients should not be denied a potentially curative surgery on the basis of preoperative restaging after chemoradiotherapy. This retrospective study is limited by inherent problems such as missing medical charts, incomplete records, potentially inaccurate data, and lack of a control group. Most pertinent is the lack of an appropriate surgery-only control group. Unfortunately, survival data cannot be fairly compared between the CRS and SA groups because of the predominance of early-stage esophageal cancers in the SA group. This difference is attributable to our practice to treat early cancers with surgery as the sole modality. The inclusion of the SA group in this study, however, allows us to assess and compare the morbidity and mortality with and without neoadjuvant therapy. Finally, this study is underpowered by the limited sample size (31 patients in the neoadjuvant therapy group) and, hence, fails to demonstrate a statistically significant improvement in survival. A tailored therapeutic approach to neoadjuvant chemoradiotherapy for esophageal cancer is possible with accurate preoperative staging. The analysis of our experience with 123 Ivor-Lewis esophagectomies for squamous cell carcinoma and adenocarcinoma of the esophagus showed a trend (P = .15) toward increased 3-year survival in the subset of patients with locally advanced cancers (transmural or node-positive) who received neoadjuvant chemoradiotherapy. Larger randomized clinical trials are warranted to study the efficacy of multimodal therapy in patients with esophageal cancers of this stage. Corresponding author: Gerard V. Aranha, MD, FRCS, Department of Surgery, EMS 110-3236, 2160 S First Ave, Maywood, IL 60153 (e-mail: garanha@lumc.edu). Accepted for publication January 19, 2004. This paper was presented at the 111th Scientific Session of the Western Surgical Association; November 12, 2003; Tucson, Ariz, and is published after peer review and revision. The discussions that follow this article are based on the originally submitted manuscript and not the revised manuscript. Claude Deschamps, MD, Rochester, Minn: I congratulate Dr Malaisrie and his colleagues. They report their 9-year single-institution experience with resectable esophageal carcinoma. They told us an interesting story about 123 patients who had esophageal cancer and were managed 3 different ways. Or, was it really 3 different ways? Yes, there were 3 groups, but there were also 2 different chemotherapy regimens, 2 different radiation-planning modalities, 3 different histologies, and 2 staging modalities—CT and ultrasound. They did not use PET scan, but almost nobody really did anyway during that time period. Thankfully, there was only 1 operation, which was an Ivor-Lewis esophagogastrectomy. This is a retrospective series. The number of patients is certainly respectable. The authors found that with neoadjuvant therapy, complete response was 16% and partial response was 48%. Survival of the neoadjuvant group was better than the adjuvant group, almost significantly different at 3 years. We cannot compare the surgery-only group to the other 2 groups because they were of different stages. The authors should be congratulated on their low operative mortality. It would have been nice to have local and systemic recurrence rates. In their very able discussion, they are a little hard on themselves at pointing out several shortcomings. I actually think they should be a little cockier. Since the Walsh study from Dublin in 1996, which showed a significant survival advantage with chemoradiation and surgery compared to surgery alone, attempts to perform randomized trials in the United States have been unsuccessful. Neoadjuvant chemoradiation followed by surgery has become the standard of care in most centers, almost overnight, and the Walsh data has not been duplicated yet. Is this the result of medical oncology conspiracy? Maybe not, but until this is corrected, science unfortunately will have to progress a little bit at a time and Dr Malaisrie's contribution has done just that. We look forward to seeing their data at 5 years. I have 3 questions. (1) Since the authors had a few stage IV patients who I assumed were M1a, what do they recommend currently for celiac node disease in cancer of the distal esophagus? (2) What about their current recommendation regarding postoperative adjuvant treatment, since the Macdonald-Smalley trial reported in 2001 showed benefit from such treatment in selected patients? (3) Like us in Rochester, they seem to favor the Ivor-Lewis approach. Have the authors been tempted by the minimal invasive esophagectomy? Dr Aranha: There was only 1 patient who had a liver metastasis and that was in the adjunctive group. The liver was biopsied, the operation done, but I'm not sure whether there was a frozen section done on the biopsy itself. However, I think more pertinent is the question, what do you do if you have celiac node disease? Those patients automatically fall into the neoadjuvant group, and we've cut the study off in December of 2001 because we wanted to have enough time to give you a meaningful median survival data. Since then, those patients in the neoadjuvant group do not get an EUS post therapy because EUS is truly useless after preop, radiation, and chemo. The fibrosis interferes with interpretation of the data. So I use a PET scan, and in 5 years, hopefully, we can give you more information on that. If the PET scan shows activity in the celiac axis or CT shows no response in the nodes at the celiac axis, we will not do the operation. But if there is no positivity, we will go ahead with the operation. What is our current postoperative adjunctive therapy? It is 5-fluorouracil and cisplatinum. And the third question is easy to answer. Since I have no experience in minimally invasive or laparoscopic esophagectomy, as I suspect that was your question, I cannot speak to it, but I would think that those patients who are undergoing esophagectomy for Barrett with high-grade dysplasia and possibly carcinoma in situ might be individuals who would fit criteria for such an operation. David W. Easter, MD, La Jolla, Calif: Your study design looked only at Ivor-Lewis esophagectomies. How many of your patients were therefore excluded from the study, specifically, those who had neoadjuvant therapy and then went on to not have subsequent surgery? My guess is that some progressed during neoadjuvant therapy to an unresectable state, and this actually biased the selection of your patients for a more favorable outcome, since these patients would not be included in your analysis. I'm curious if you have analyzed for this potential bias. Dr Aranha: Yes, there is a very small number. I can't give you exact percentages, but it would be about 15% that progressed during treatment. I believe that neoadjuvant allows you to choose those patients who are going to progress and that is another advantage of using neoadjuvant therapy. In some patients, treatments had to be reduced because of toxicity, but they all finished the treatment and went on to surgery. Vic Velanovich, MD, Detroit, Mich: I enjoyed this paper. I always enjoyed papers that essentially support the way I do things. Did you have any subset of patients where there was a significant delay between the neoadjuvant treatment and the surgery? I have a small group of patients that get referred to me after a recurrence, after receiving chemoradiation, and then they had an endoscopy, and they said, well, you had a complete response, you don't need surgery. That group of patients is very difficult to operate on, and I wonder if you have information on that? Dr Aranha: We have a gastrointestinal oncology group that meets every Thursday, and these patients go to that group. After completing their chemoradiation therapy, they undergo restaging and are taken to the operating room within 4 to 6 weeks. I do not believe that there was anybody who waited longer, but I do know of some others who say that the longer you wait, the more difficult the operation. In all of our cases, the operation was done between 4 to 6 weeks after completion of neoadjuvant therapy. Norman C. Estes, MD, Peoria, Ill: I think people would be excited to see an improved survival in the neoadjuvant group. How did you calculate survival? It becomes an interesting question because normally we calculate survival from the operation and not the date treatment began. If you calculate survival from the treatment date, which would begin with the beginning of the neoadjuvant treatment, you would have almost a 2-month survival advantage in the neoadjuvant group. Dr Aranha: We calculated survival from the date of surgery. Some patients had to have their treatments modified and might have even gone to surgery 5 months after the beginning of the neoadjuvant therapy. Most of the time they go to surgery 3 months after they begin treatment. Dr Estes: And if you took the dates where treatment was begun, that would erode or erase your benefit in the neoadjuvant group, which is interesting because some of the patients were in complete remission. Dr Aranha: That is an interesting question and something we should look into. Thank you all for your questions. Raymond J. Joehl, MD, Hines, Ill: I rise to congratulate the authors and to let those from Houston know that Dr Malaisrie has matched at the Baylor Thoracic Surgery program and will begin in July 2004. He's finishing at Loyola University as a "complete" surgeon. And, after training at Baylor University Medical Center, I'm sure he will be a very "complete" surgeon.